The graphics chip of your notebook or Macbook does not work properly? The image shows weird symbols, has streaks or is divided into several sections? We change the graphic-chip within the shortest time (usually the same day). 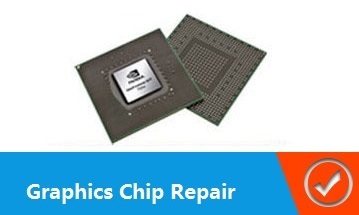 If the graphics-chip is defective and can no longer work properly with your PC or laptop, we can help you quickly and inexpensively with a graphic-chip repair. In the area of Berlin we complete your order usually the same day, so that you can work quickly with their notebook, laptop or MacBook again. We not only give you a competent and professional, but also a very inexpensive repair. Repair methods like remelting of the graphics chip are only a short-term solution that usually helps for 3-5 months. We suggest a replacement of the graphics chip, which we offer to do professionally and reasonably prized on the same day. With our Express Service, we make sure that you can quickly get back to work with a fully functioning computer. With years of experience and specialized expertise, we can start with the graphic-chip repair and realize if your order is reliable. We are the service provider and best contact for repair in and around Berlin. We will bring your MacBook, laptop or notebook back on track in no time. With our express service you dont have to take long waiting periods and can rely on a service that is carried out reliably, professionally and competently. We are your partner to help you on graphic-chip repair to make your device quickly functional again.